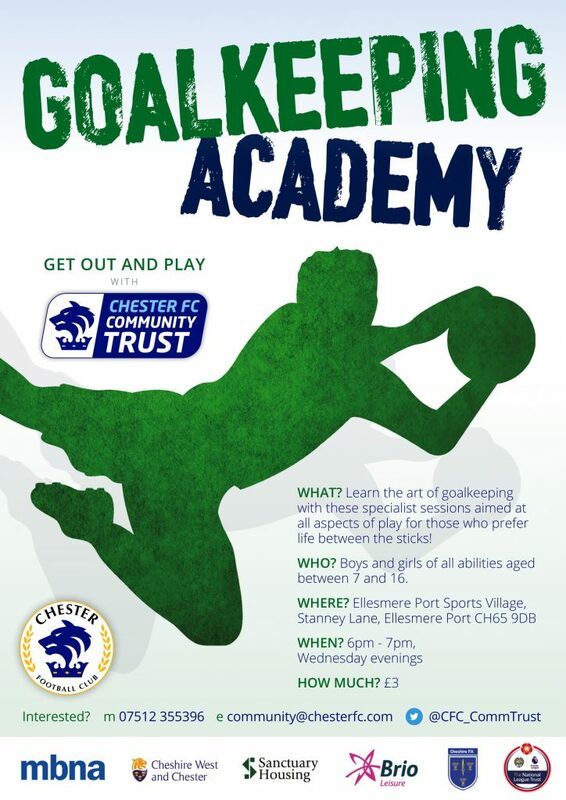 Chester FC Goalkeeping Academy sessions are restarting on Wednesday 14th November at the new venue of Ellesmere Port Sports Village. The popular sessions provided specialist coaching to help those boys and girls who prefer to be between the sticks to learn the art of goalkeeping. The weekly sessions will run on Wednesdays from 6pm-7pm on the 3G pitch at Ellesmere Port Sports Village on Stanney Lane. Goalkeepers of all abilities and levels of experience who are aged 7-16 are welcome to attend and the cost is just £3 per week with no pre-booking or advance payments required. For more details about the sessions, contact 07512 355396 or email community@chesterfc.com.